The post title refers to the wheely case of hand-dyed yarns that I bring along to our regular local knitting group meetings. Sometimes I even bring two wheely cases! But first a bit of update on the Yarn Club. Sign up is still open. I can positively say that there are only 3 places left in the Club. I am back in full-time employment so best not to over reach with regard to the Club. The yarns for the first kit are all dyed up. The Club swag is ready but needs to arrive at my front door. And the pattern is being given final tweaks. I am excited. I hope you are too. Back to the topic at hand then. 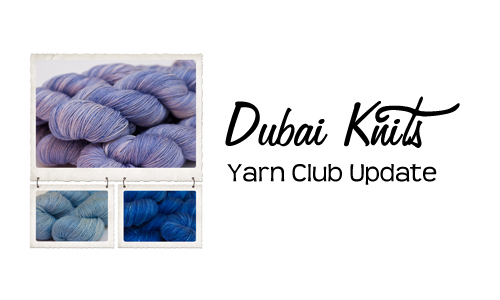 Not long ago, I received a surprise message on Ravelry from an Australian knitter who was travelling to Europe and then making a 1-day stop in Dubai on her way back home. She asked if she could see some of my hand-dyed yarn. I was giddy like a little girl going trick or treating! I said yes, of course and we went on to plan our meeting date. I dyed one-of-a-kind colourways like a mad woman (not that I wasn’t already one!) in preparation for her visit. The day of her visit came and I went to see her, along with fellow Aussie Mel who was only too happy to knit with us. Mel and I arrived a little early and settled ourselves at the hotel’s coffee shop where Jan was staying. Jan came through the lift a few minutes later. Since we did not know what each other looked like, she planned on laying out a couple of pairs of socks she knitted up while she was in Europe! But we beat her to it and we had out knitting out and I even wore my It’s All About the Knitting t-shirt for the occasion. Anyway, we started chatting up a storm rightaway like we knew each other for years instead of just weeks. It was so easy talking to her and hard not to like her instantly. After Mel and I had our lunch and we settled into knitting, Jan asked to see the contents of the wheely case and bag I brought with me. She had to run out to the front door of the hotel in natural light to really see the colours. The coffee shop had dim yellow lighting so it drowned out the colorus of the yarns. Jan said the doorman offered his opinions the third time she walked out with a handful of skeins! These are the skeins she settled for, after about 15 minutes of search and going back and forth and digging into the wheely case a bit more. Jan bought some industrial dyed yarns in her travel so I was only happy to satisfy her craving for hand-dyed yarns. She was also shopping for a Sock Swap partner who will be receiving a pair of hand-knitted socks from this vivacious, kind and sweet knitter. It was great to meet you, Jan and I do hope this is not the last time your travels take you to Dubai. Happy knitting! How fun!! I just love that you guys got to meet up and that she enjoyed your gorgeous yarns! What a fun way to meet another knitter from half way around the world and I love that she loved your Traveling Suitcase of String. I’m soooo excited to see what the first kit of the yarn club is going to be – can’t wait!!!!! I love your travelling suitcase of string – did you notice how well I restrained myself yesterday :D?